Classification from Vaughan and Wells (1943) and Wells (1956), as modified and amended by Cairns (1989a, 1995) and Stolarski (1996, 2000). Those genera marked with a cross ( ) are known only from the fossil record, whereas the unmarked genera contain living and, in some cases, fossil species as well. 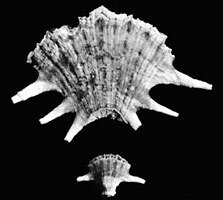 The flabellids are known from the Early Cretaceous (about 135 million years ago) to the Recent, and are widespread in today's oceans from the North Sea to continental Antarctica. They range from depths from 0 to 3200 meters and from temperatures of -1°C (continental Antarctica) to the tropics. They are exclusively azooxanthellate. Flabellids range in size from the small Falcatoflabellum, which is only 3 mm in greater diameter and 10 mm in height, to Flabellum impensum, which is one of the largest solitary Scleractinia, measuring up to 128 mm in greater calicular diameter and 80 mm in height. One hundred three Recent species are known in 11 genera, most of these (73) occurring in two speciose genera: Flabellum and Truncatoflabellum, and the rate of description of new species shows no decline (Cairns et al., 1999). The flabellids are better represented in the fossil record, there being almost twice as many fossil species as Recent (Cairns, 1989a). Flabellids are exclusively solitary in growth form -- never forming colonies -- but certain genera reproduce asexually by transverse division (Cairns, 1989b) and budding from the thecal edge. The corallum of many flabellids is fan-shaped, as implied by the root of its name (flabellum, Latin for a small fan), having a calice elliptical in cross section. There are as many attached as free living forms, the former sometimes attached by contiguous or noncontiguous, hollow rootlets. The coralla of those genera characterized by transverse division usually bear several pairs of thecal edge spines that do not reach the substrate. 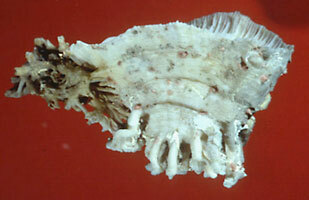 Some genera are hosts for the galls of ascothoracidan Crustacea (Grygier and Zibrowius, 1985), and one genus, Javania, is the host of the burrows of acrothoracican cirripeds (Cairns and Zibrowius, 1997). Some other publications that include significant information regarding flabellids are: Cairns (1994), Gardiner (1902), Squires (1962, 1963, 1964), and Yabe and Eguchi (1942). Flabellids are characterized by having a smooth, often porcellaneous marginotheca devoid of the pits or pores that characterize the Guyniidae. They also differ from the guyniids in general, by having larger coralla with more septa (up to 300) and flabellate vs circular calices, and in lacking pali. No phylogenetic analysis has been made of the flabellid genera. The most modern comprehensive accounts of the family are those of Zibrowius (1974) and Cairns (1989a), both of whom provide tabular keys to the genera. Characters considered to be important in discriminating genera are: type of columella, type of basal fixation, presence or absence of transverse division, and nature of the calicular edge. Recent work by Stolarski (1995, 2000) on wall microstructure may lead to a reorganization of the taxa within this family. The monophyly of the family is supported by preliminary molecular analysis (Romano and Cairns, 2000) using 16S mtDNA sequencing, which places the three flabellid genera tested in the same clade. Cairns, S. D. 1982. Antarctic and Subantarctic Scleractinia. Antarctic Research Series, 34: 1-74. Cairns, S. D. 1989a. A revision of the ahermatypic Scleractinia of the Philippine Islands and adjacent waters, Part 1: Fungiacyathidae, Micrabaciidae, Turbinoliinae, Guyniidae, and Flabellidae. Smithsonian Contributions to Zoology, 486: 136 pp. Cairns, S. D. 1989b. Asexual reproduction in solitary Scleractinia. Proceedings of the 6th International Coral Reef Symposium, Australia, 2: 641-646. Cairns, S. D. and H. Zibrowius. 1997. Cnidaria, Anthozoa: Azooxanthellate Scleractinia from the Philippine and Indonesian regions. Mémoires du Muséum d'Histoire Naturelle, 172: 27-243. Gardiner, J. S. 1902. South African corals of the genus Flabellum, with an account of their anatomy and development. Marine Investigations of South Africa, 2(6): 115-154. Grygier, M. J. and H. Zibrowius. 1985. Diversity and range of scleractinian coral hosts of Ascothoracida (Crustacea: Maxillopoda). Annals d l'Institut Océanographique, paris, 61(2): 115-138. Romano S. L. and S. D. Cairns. 2000. Molecular Phylogenetic Hypotheses from the Evolution of Scleractinian Corals. Bulletin of Marine Science, 67(3): 1043-1068. Squires, D. F. 1962. Deep sea corals collected by Lamont Geological Observatory. 3. Larvae of the argentine scleractinian coral Flabellum curvatum Moseley. American Museum Novitates, 2078: 11 pp. Squires, D. F. 1963. Flabellum rubrum (Quoy and Gaimard). New Zealand Oceanographic Institute Memoir, 20: 43 pp. Squires, D. F. 1964. Biological results of the Chatham Islands 1954 expedition. Part 6: Scleractinia. New Zealand Oceanographic Institute, Memoir 29: 29 pp. Stolarski, J. 1995. Ontogenetic development of the thecal structures in caryophylliine scleractinian corals. Acta Paleontologica Polonica, 40: 19-44. Stolarski, J. 1996. Gardineria - a scleractinian living fossil. Acta Palaeontologica, 41(4): 339-367. Stolarski, J. 2000. Origin and phylogeny of Guyniidae (Scleractinia) in the light of microstructural data. Lethaia, 33: 13-38. Vaughan, T. W. and J. W. Wells. 1943. Revision of the suborders, families, and genera of the Scleractinia. Geological Society of America, Special papers, 44: 363 pp. Yabe, H. and M. Eguchi. 1942. Fossil and Recent Flabellum from Japan. Scientific Reports of the Tohoku Imperial University, series 2 (Geology), 22(2): 87-103. Zibrowius, H. 1974. Révision du genre Javania et considérations générales sur les Flabellidae (Scléractiniaires). Bulletin de l'Institut Océanographique, Monaco, 71(1429): 48 pp. Page: Tree of Life Flabellidae Bourne 1905. Authored by Stephen D. Cairns. The TEXT of this page is licensed under the Creative Commons Attribution-NonCommercial License - Version 3.0. Note that images and other media featured on this page are each governed by their own license, and they may or may not be available for reuse. Click on an image or a media link to access the media data window, which provides the relevant licensing information. For the general terms and conditions of ToL material reuse and redistribution, please see the Tree of Life Copyright Policies.